At Allstar Karaoke we pride ourselves on bringing the finest Karaoke Music to our customers. Regrettably, we have not always been able to do that. We were never in a position to acquire “Sound Choice” Products at a price permitting us to be competitive. Recent developments changed this to some degree and we will now be able to offer the complete “Sound Choice” Karaoke Music Library at competitive prices. “Sound Choice” have invested much time and money to offer their customers a Superior Product and they continue to invest in an effort to stamp out Piracy and assure their customers; they will get the very best product available, the product they receive will be legitimate and the price will be reasonable while still allowing payment for all of the royalties and licensing required. When you purchase “Sound Choice” you are supporting Artists, Writers and Musicians who created the Music you choose to perform and ensuring continued production of high quality Karaoke Music in the future. We feel privileged and grateful for this addition to our Libraries of Karaoke Music and look forward in anticipation of your support for “Sound Choice”, a Company with your best interests in mind whose integrity has never wavered even with continued production and distribution of counterfeit and pirated product which for the most part is generally sub-standard quality. You Don't Have To Be A Star (To Be In My Show) - - Marilyn Mccoo / Billy Davis Jr.
Duets Karaoke songs on CDG CDs V2 - 16 Karaoke Songs for duets - Disc Number 2 of 6. These Chartbuster discs are now available as singles for the first time. 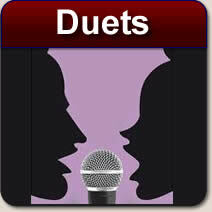 Duets Karaoke songs on CDG CDs V2 - 16 Karaoke Songs for duets - Disc Number 3 of 6. These Chartbuster discs are now available as singles for the first time. Duets Karaoke songs on CDG CDs - 16 Karaoke Songs for duets - Disc Number 4 of 6. These Chartbuster discs are now available as singles for the first time. Duets Karaoke songs on CDG CDs - 16 Karaoke Songs for duets - Disc Number 6 of 6. These Chartbuster discs are now available as singles for the first time. You Don't Have To Be A Star - - Marilyn McCo and Billy Davis Jr.
Priddis Faith Series - "Lord of Heaven and Earth"